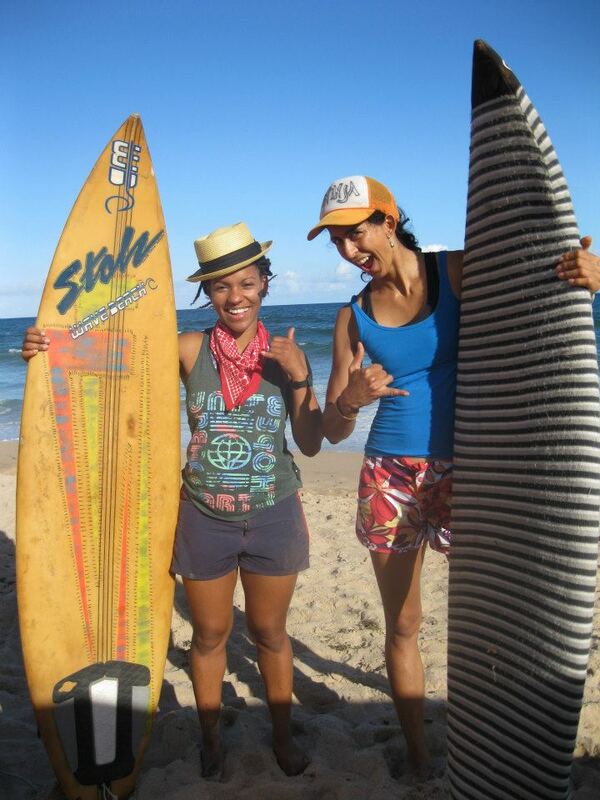 Mira’s surf adventures | Surfer Grrrls Brazil! 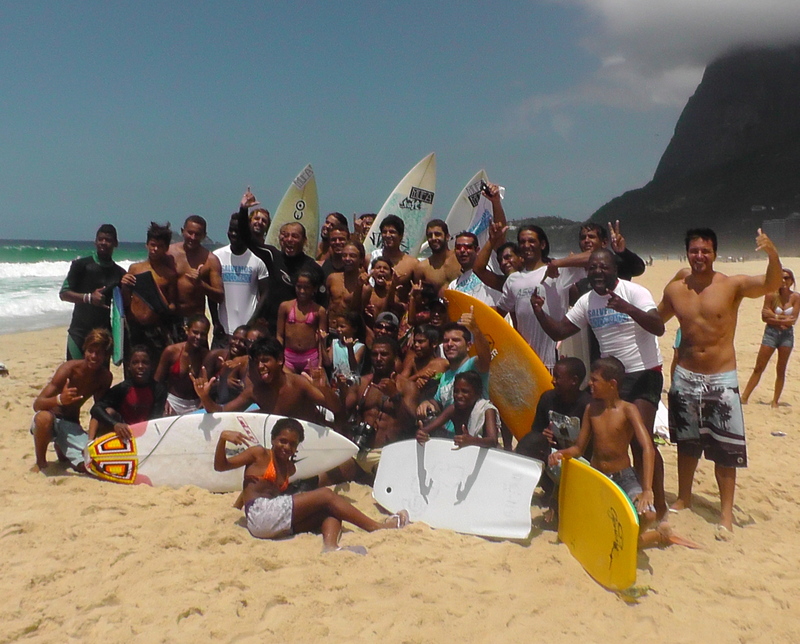 One of the hardest things I did before I left was selling my Brazilian surfboard. We had so many great adventures together it was hard to say goodbye! 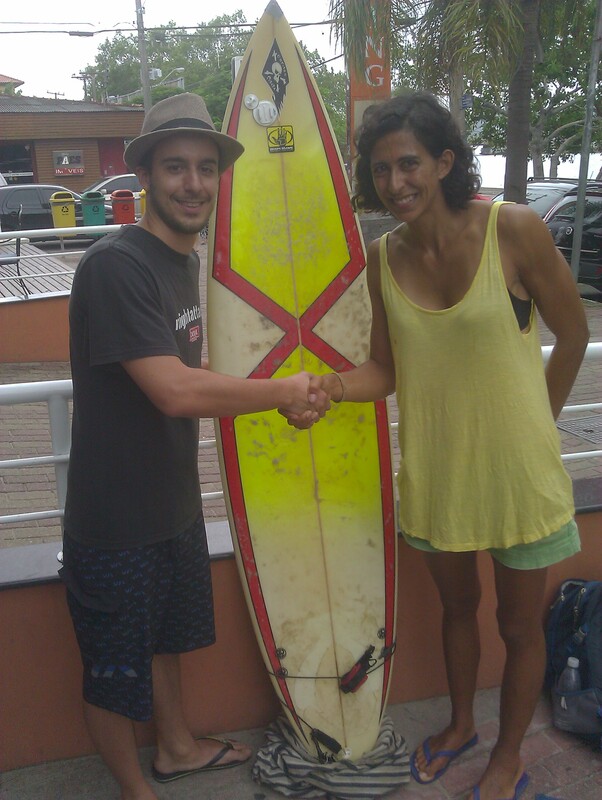 But I found a worthy new owner, Tiago, who is taking advantage of his year studying in Floripa to learn how to surf. I am hoping he will have many more great surf adventures with the Pirate Captain surfboard. Boas Ondas Tiago! A few days ago I got on an airplane, with sand still on my feet and salt still in my hair, and left the sunkissed wide open coast of Bahia. I landed in Florianopolis, where I had 2 hectic days to reunite with my host family, have lunches and dinners and samba dances with my beloved friends there who I hadn’t seen in over 4 months, and organize all my belongings for my flight back to the United States. After that, I sprinted to the airport, got on a plane, and left behind the green mountains and crystal beaches of a Brazilian summer in full bloom, and landed in cold, wet, snowy New York City. The transition has been jolting to say the least. My mom and dad have been hosting me the past few days, and I’ve had lots of quality time to share my adventures with them and snuggle down in a warm cozy couch and reflect on my 6 month journey in Brazil. I am overwhelmed with gratitude for all that I have been allowed to experience, and the incredibly kindness of the people who I met and who took me in. To write it all down here might overwhelm my readers, the list in my journal stretches across 9 pages. Ways to Keep Brazil Close, even when you are far away. Live in your body like they do so well in Rio, where grown ups and kids ride skateboards to the beach, because skateboards are really fun! Where kids are always practicing carthwheels. Where half the city surfs. Where my friend Bocão always thought to throw a slackline in the backpack, just because its fun to challenge your body and do tricks with it. Where I saw one of the runway traffic controllers at the airport in Rio, who looked a bit bored sitting on the edge of the runway, do a backflip just to pass the time as my airplane took off. Be helpful and friendly to strangers, like all the people on the buses of Salvador who helped me get my surfboard over the turnstile or helped me carry my luggage down the stairwell. It diminishes the distance between you and others, and makes the world a much gentler and kinder place. Keep an open hearth and home – like Susana and Hugo and Daniel who took me in sight unseen in Floripa, like Maily who housed and fed me for a week when I showed up on her doorstep and said I was a friend of her friends, like Andrew who let me sleep on his floor in Rio for 4 nights, like Colin who wove me into the life of my Bahian host family as soon as I showed up at the airport, like Bocão who made me feel a part of the Rocinha surf school community, like the staff at the gym in Floripa who shared many Ninja tricks with me, like just about everyone in Brazil. 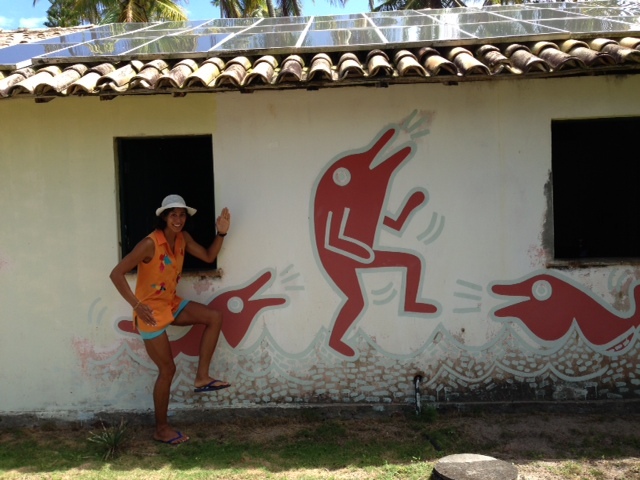 Love, listen to, research, sing along to, and dance to Brazilian music. It is the best in the world and will always conjure memories of the places from which it came. Surf like a girl! 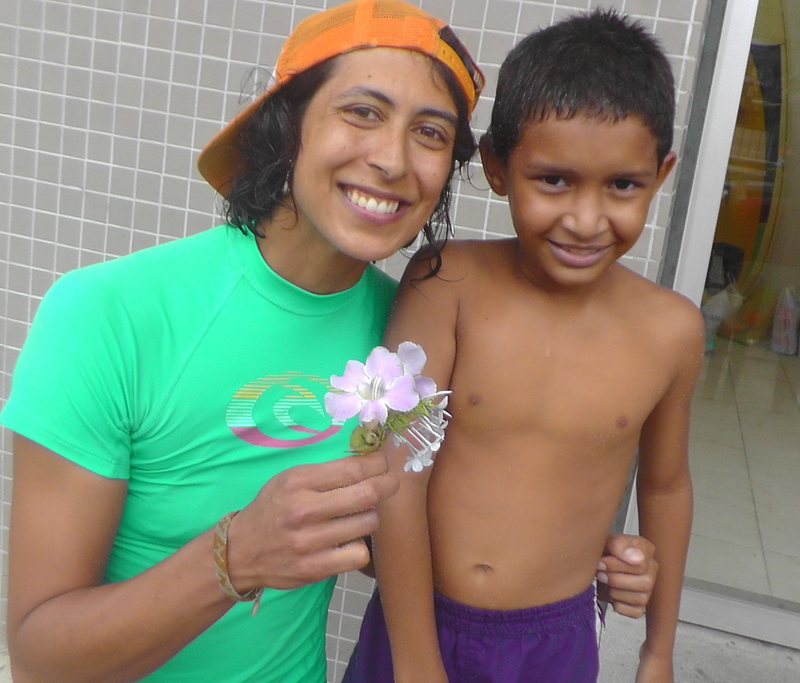 Thanks to all the girl shredders of Brazil, and especially Floripa, who brought me along with them and inspired me. 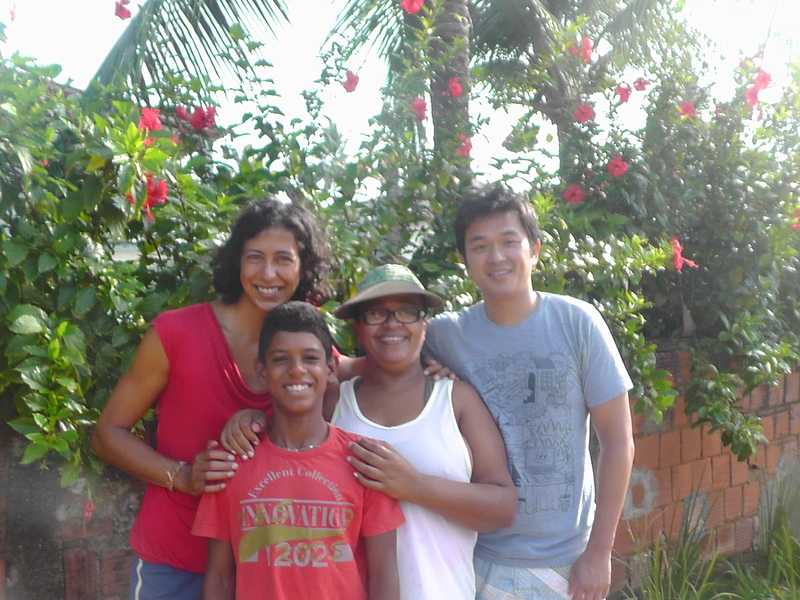 Act a little bit more like my friends in Pe de Serra, where life was less cluttered and more humane, where there was no internet, and where everyone knew everyone else, and focused their energy on caring for each other. Where my 13 and 14 year old surf buddies Icaro and Nininho always gave their motherly next door neighbor a kiss on the cheek when they came home from school, helped her clean her yard, did their homework, kindly waited for their new friend the gringa (that’s me!) to go surf, and wooped for every wave that any of us caught. Try thinking of money a little more like Ronaldo, who rented me the most beautiful house I had ever seen on the coast of Itacare and had the most non-capitalist outlook of any person I’d ever met. He could have rented that house for five times the price, but he wasn’t interested in raking in dough. He stopped by to check on me and bring me fruit, lived pretty much day to day on the rent I paid him, had no cell phone, went swimming every morning in the ocean, and was one of the happiest people I’d ever met. Don’t put music on a special stage, keep it part of daily life. Don’t be worried if you are good at your instrument or not, just keep playing it and take it with you whenever you go to the beach. Have regular jam sessions at the kitchen table. If you don’t have an instrument, be like the kids in Candeal, Salvador, and start a band with water jugs and oil drums, then practice every day for 4 hours in the middle of the playground. Be laid back enough to welcome the unexpected, even when you are in the middle of something you prepared very carefully. In Salvador, I went to a concert of Carlinhos Brown, who is pretty much like the Stevie Wonder of Brazil – a musical genius whose songs are beloved by just about everyone. During his concert, he welcomed all sorts of unexpected events – a woman in the audience who wanted to sing her own song onstage with his band, a 5 year old child whose parents lifted him onto the stage, the impromptu confessionals of love from his fans in the front row. For each of these, he quieted the band and rolled with the flow. It was amazing. Free your skin (when the weather’s warm!). In Brazil I got the best tan of my adult life. I feel like my tan is a metaphor – a way of living in my body, of being outdoors everyday, of being close to nature in my daily experience of the sun, the waves, the sand– of the freedom and lightness of wearing little clothing and of living in communities with little formalities and where all bodies were welcome. It’s hard to keep up in the land of 4 seasons, but relish it when you can. When you meet people for the first time, remember their names, and say, “It’s a pleasure to meet you __(fill in name here)_____.” Now that I am not in Brazil anymore, I miss this way of greeting. The list could go on, but I’ll cut it off here. While I continue to miss Brazil, I will edit my videos from Rio and Bahia. So keep an eye on the blog to catch their release! 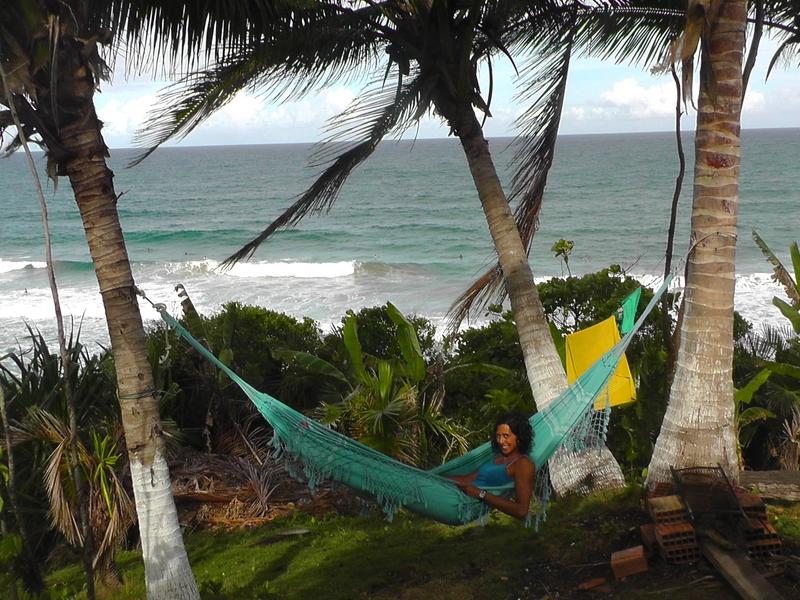 Better than television… check out the view of the surf break I had from my hammock! For the last couple weeks I have had the joy of living and surfing in a place that the internet has not yet infiltrated. 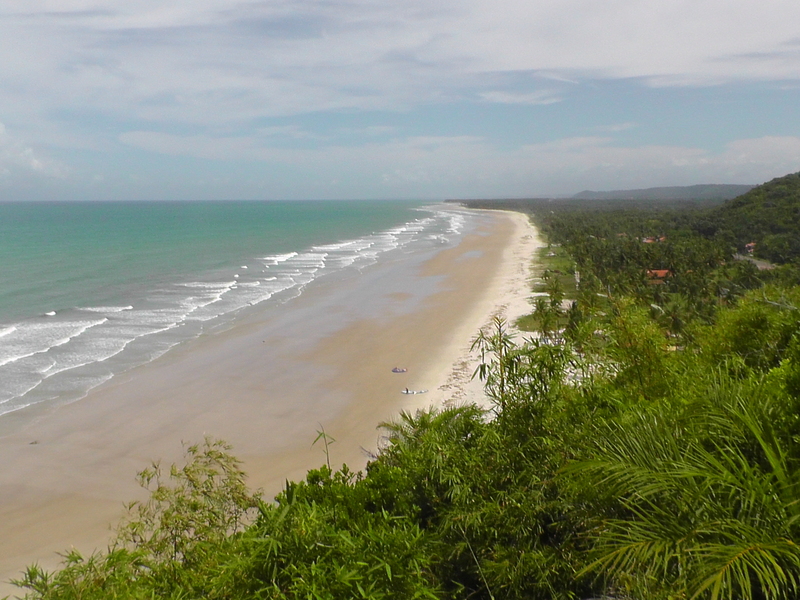 The coast of Bahia, south of Salvador to Ilheus is a world apart. I have never met people more open, more kind, and more generous than the folks who live there. It’s as if the memo about capitalist striving never made it there, and as a result, it is a much more humane and friendly place, where the guy selling soda at the beach will rent you his seaside cliffhouse for peanuts, just because he thinks you’re a nice person, and where people with very little share all they have. Erica, my new surfer grrrl friend from Itacarea, enjoying her home break. met a couple awesome ladies, Erica, and Fernanda who kept it real and kept me inspired on the break. tell her that I was his friend. Armed with only this information, I lugged myself and all my belongings on a steamy bus heading down the coast of Bahia, hoping that my good luck would keep up. I got off at the bottom of the hill, and the first ladies I met on the beach pointed me towards Maily’s house. I arrived there unannounced in the middle of a little barbecue that she was hosting, and nervously announced that my name was Mira and I was a good friend of Jeff. Immediately her face lit up, she welcomed me, sat me down at a table, and fed me a delicious plate of food. I would spend the next week with her, constantly touched by her kindness and generosity, given without reservation on a moment’s notice. 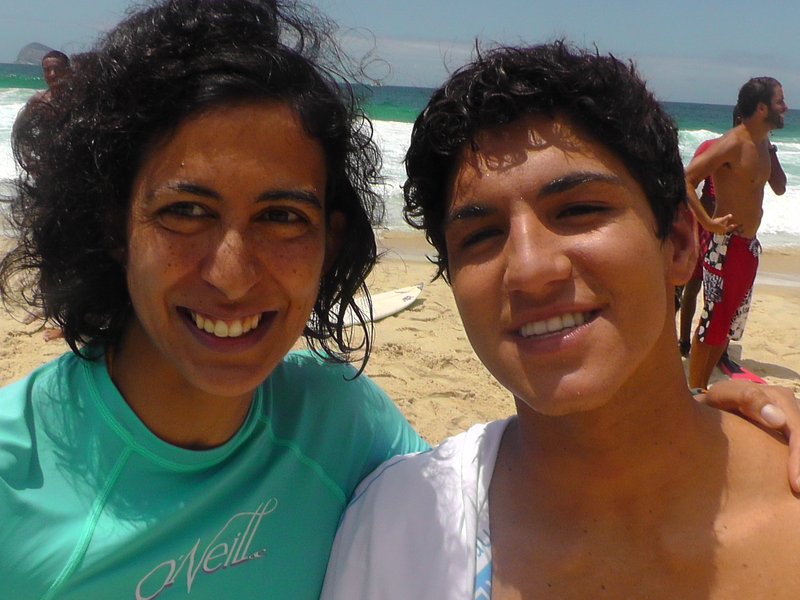 In Pe de Serra, The local 13 and 14 year old surfer boys waited for me every day after school to go surfing, and took me on excursions to far off beaches where we had the whole ocean to ourselves. Every night we sat around Maily’s TV, eating dinner, looking at photos, and discussing the nightly novellas. To make this leg of the journey even more special, I was joined by my dear friend Jack, who was spending only a week in Brazil, and found his way to Pe de Serra to meet me. I felt like I was soaked in a rich marinade of love for the time I was there. It was tempting to stay forever. But alas, I had to keep moving on. Saudades de Bahia!!! Finally some cool surfing pics of me! I have been travelling through Brazil for nearly 6 months, surfing A LOT. 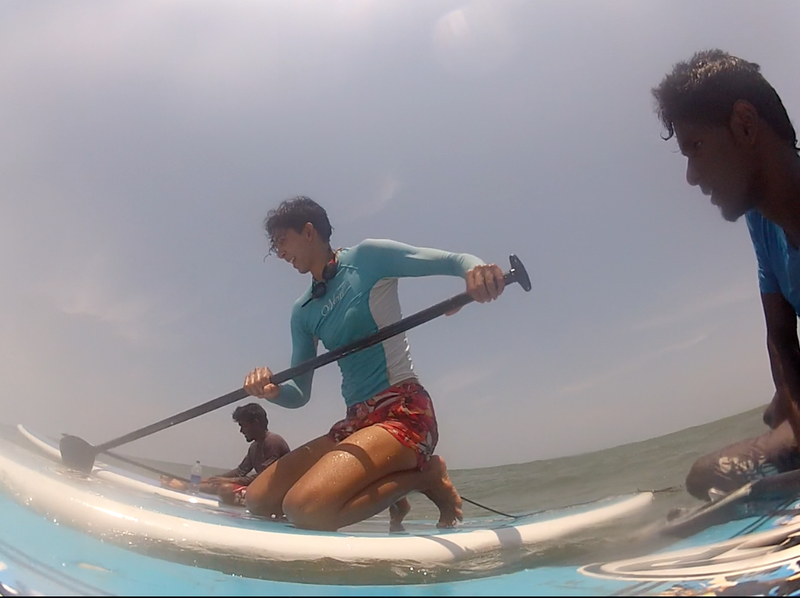 But somehow, I have very few good images of me surfing. Whenever I am lucky enough to have a friend nearby who is kind enough to film me, the waves have been small or badly formed. I have been spending the last precious moments of my trip on the coast of Bahia, surfing my heart out in this warm tropical water, and I finally got some cool images of me catching some nice waves, from my awesome new friend, Itamar, the surf photographer of Itacare. Check it out!